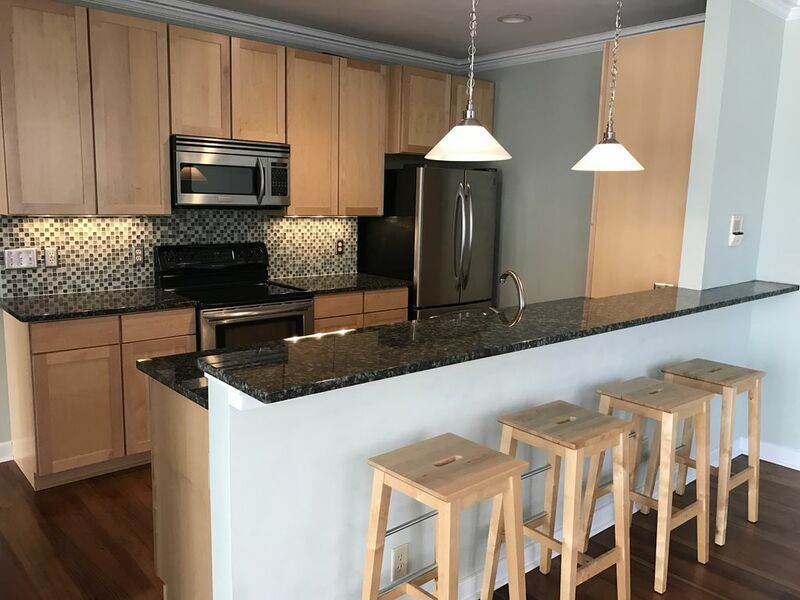 Gorgeous two bedroom two bathroom condo in the dead center of Savannah's famous downtown. Steps from dozens of restaurants! Steps from all the famous museums! Wright Square is right outside the building door. This unit is on the 2nd floor of a historic building where the street level is occupied by quiet retail stores. There is no elevator so guests must be able to use stairs to get to the 2nd story. View of Bull Street from the living room. The condo is updated throughout with lovely hardwood floors, plantation shutters and modern bathrooms plus high end kitchen. Master bedroom has King size bed and en suite bathroom has a walk in shower. 2nd bathroom is off the hallway with combination tub/shower. Sofa is a queen size pullout bed, and the ottoman has sheets for sofa bed. All day street parking is best handled with a Visitors Parking Day Pass from the City of Savannah Visitors Center. The Pass is $15 per day and covers city parking garages or the on-street public parking spots which are numbered. I am Mary Anderson, the owner of Savannah Luxury Rentals, and a a licensed real estate salesperson here in Savannah. I look forward to hosting your vacation! This is a comfortable home away from home, right in the center of our beautiful city's bustling downtown area. Fine dining, museums, boutiques and other tourist destinations abound right outside the door! Epicenter of Savannah's Downtown Historic District. This is on the block with Collins Quarter, across the street from Wells Fargo bank and the famous Wright Square. Modern finishes, and all the cooking equipment one would need for basic meal preparation. It was very clean and comfortable. Very noisy, pull out couch was very uncomfortable. Loved savannah. Kitchen was well stocked to cook. Very nice and comfortable. Plenty of room. What an amazing experience we had with this condo! This was the perfect unit for our girl's trip, it was roomy, clean and well equipped. We couldn't have asked for a better location, since it was far enough removed from busy Bay street but centrally located a block away from stores and restaurants on beautiful Broughton. We were just a short walk away from the park and other wonderful places to visit. There is even an access card to the closest parking garage for one car. The only reason I did not give it 5 stars was the noise in the alley located right outside the bedroom windows. You can hear businesses dumping their trash at all hours and can also hear everyone's conversations as they walk by, since it is a pretty central street. We purchased some ear plugs from the CVS across the street (the only one in the district, so great to have nearby) which made the noise manageable. Overall, it was a great condo, very safe and secured! Highly recommended! Fantastic place in the middle of the historic district !! Pros; Huge master bedroom with a great closet/laundry room and plenty of storage space. The common area is also fantastic with a kitchen that has everything you need. The location is awesome and you could not be in a better spot.... restaurants, shopping and services all within an easy walk. The property owners were very accommodating and prompt with anything we needed. I would absolutely stay here again !! Cons; as clearly stated it is a second floor unit. There are 24 stairs to the second floor. Not an issue for us but if you have any issues with stairs, this may not be the best option for you. Second, I am an early riser but if you want to sleep in past 5 AM this is not the place for you. The trash trucks, food delivery trucks, etc are just outside the door beginning at 5, and continue for a couple hours every morning. Again, if you’re up early it may not matter. You could wear ear plugs to help decrease the noise level. I would absolutely stay here again. This is 2 short blocks from Bay Street overlooking Savannah River. This is the sought after northern portion of the Historic District. Rates are subject to change until confirmed directly with manager. Events and holidays will have higher than standard rates, and/or longer required minimum stays. Please inquire for a specific quote.